The surge arresters of the Dehn Blitzductor SP series are pluggable multi-pole DIN rail mounted arresters with integrated earthing. They can be universally used for protecting measuring and control circuits, bus systems or telecommunication infrastructure. The arresters combine a permanently high impulse current discharge capacity up to 20 kA (8/20 µs) with an extremely low voltage protection level, thus ensuring effective protection of terminal equipment even in case of interference caused by impulse currents and surges resulting from switching operations. The arresters provide protection against vibration effects and shock up to 30 times the acceleration of gravity. They ensure maximum system availability since the modules can be replaced without signal interruption (hot-swappable). The arrester consists of a protection module and a base part. The function-optimised design ensures both fast and easy replacement and maintenance of protection modules which house all relevant protection components. Though mechanically strong in its function, each SPD module can easily be removed by squeezing the side tabs to unlock the module. Insertion is easy and secure when the mechanical “click” is heard and felt. 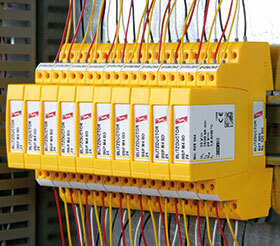 A mechanical reverse polarity protection ensures that a module is always installed in the correct position. Two universal base parts are optionally available with or without signal disconnection. The Blitzductor SP arresters require minimum space, with four single lines or two pairs only covering a width of 12 millimetres. For DIN rail mounting purposes, lines of a pair belonging to each other are connected on top of one another (vertically). The universal base part not only minimises storage requirements but also eases wiring and maintenance operations. Additionally, the base part metallically bonds the arrester module to the rail allowing for easy grounding of the arrester. The products were tested in third-party laboratories according to application and country-specific requirements and standards. For example they can be applied with SIL ratings for use in systems requiring high reliability and safety. They are also UL 497 listed.